At a Halloween party, 12 year old Joyce claims she has witnessed a murder. Little does she know that later, she will be in one. Joyce’s body is found lying in an apple bobbing tub. The great detective Hercule Poirot is called upon to solve the mystery. He first interviews Ariadne Oliver, a writer, and a friend of the host of the Halloween party, but all that is derived from that interview is the fact that Joyce was arrogant and not many people liked her. Mrs. Rowena Drake, the woman who is giving the party, is interviewed. She says that she broke a vase and that’s why the water spilled everywhere. Many people who live in Woodleigh Common, near the Drakes, and people who attend the party are interviewed. First, someone named Superintendent Spence, a retired policeman, is asked about what could have happened. Even he was surprised because there were no signs of struggle. Many people are asked about all of the people that attended the party. There are still no dead giveaways or strong clues. Mrs. Llewellyn-Smythe, aunt of Mrs. Drake, dies, but later it is realized that she died of natural causes. After a long chain of questioning from many different people, there is a new surprising discovery. Mrs. Drake, breaks into tears, telling Mr. Poirot that there has been another murder, which was Joyce’s brother, Leopold. However, by then, Mr. Poirot has already figured everything out, and the mystery is solved. 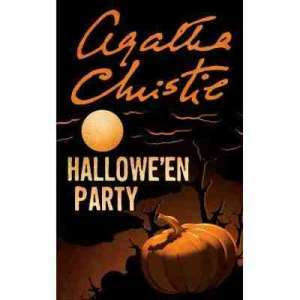 The book “Hallowe’en Party” by Agatha Christie is a classic murder mystery novel. As most stories by Agatha Christie, the detective Hercule Poirot is always on top of things, and uses clever thinking from interviews to solve the mystery. It seemed like a good story at first from hearing the conflict in the first three paragraphs, but the author droned on with long quotes. It could have used more variety in sentence structure instead of having two people talking to each other in long quotes spanning many pages. At the end, when the conflict was resolved, it became interesting as the whole story started to make sense. This book, being published in 1969, uses British language from a long time ago, using words and phrases that are slightly hard to understand. For this reason, I would recommend this book to older teenagers or any child skilled at using context clues to understand words. If I went back in time, I would choose this book, but it is more of a one-time read, as a mystery. I rate it seven stars out of ten. 1. What job does George have assisting Hercule Poirot? 2. Why did Superintendent Spence move to Woodleigh Common? 3. What genre of books does Mrs. Ariadne Oliver write? 4. Was there any water spilled from the bobbing tub? 5. What was the source of Mrs. Llewellyn-Smythe’s great wealth? 6. What made Mr. Garfield dislike Joyce. 7. How was Judith’s husband killed? 8. Why do the Drakes think Mr. Fullerton is a bad influence? 9. Why does Mrs. Drake claim she dropped the vase? 10. What affliction did Mr. Drake have that caused him difficulty walking? 11. Who does Mrs. Goodbody blame for the murder? 12. What fruit did Mrs. Oliver stop eating after the incident and why? 13. What does Miranda say that Poirot does not believe? 14. Who is the second child that is revealed to be dead? 15. Where is the eyewitness to the crime as Poirot states?